Eleanor's Closet Opened: The Pictures are In! 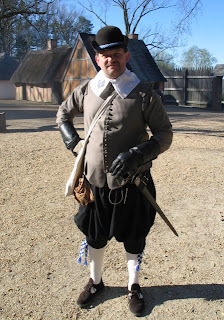 The pictures that Cindy took at Jamestown in March came in today! So now I can show off Jim's new outfit that I worked on. But first, a foodie. On some of the foodie blogs I lurk on the latest recipe has been Hot Cross Buns. Having never tried these before I collected a recipe from BBC and gave it a whirl. The only thing I would do differently from the recipe is less lemon zest. I think there is just a bit too much, so maybe half as much. I used raisins and currants for the mixed dried fruit, and pumpkin pie spice for the mixed spice. Overall light and tasty. The first picture is the complete outfit. The doublet is the new wool one I made just before MTA. The pants I let out so that he could wear them again. They are also wool, but a Christmas present from a friend. 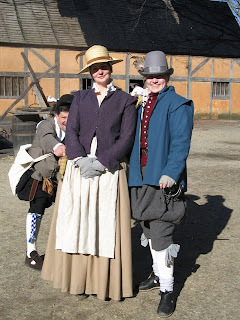 The falling band you see completed and "pinned" to the doublet collar. I actually use a long basting stitch so Jim doesn't have to worry about pins. And the shoes are the altered Clarks desert boots. Overall a spiffy looking dude. 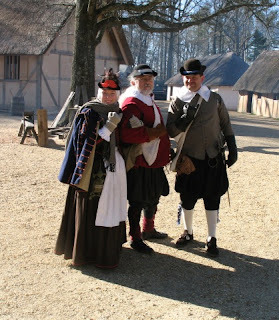 And this is Jim hanging with some friends before the Fort opened on Sunday. And Jim trying to pinch some coins from Cindy, the person who took some of these pictures for us. Wow! Jim is one handsome dude! Everything looks great!